Click the Safely Remove Hardware icon on the system tray. Choose the device you want to remove. A message appears, telling you that the device can be safely removed. 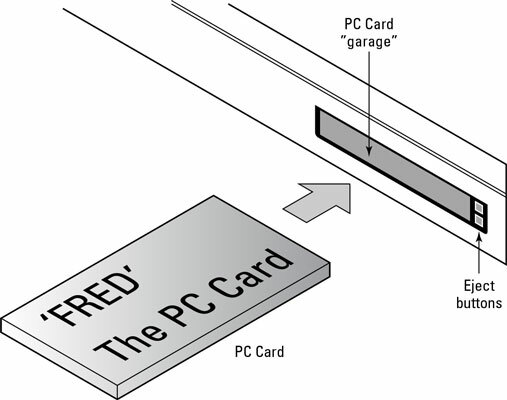 Pull the PC Card out from its slot. Some cards need a bit of help here. You have to find a small button to the right of the card. Pushing the button in a little makes it pop out about a half-inch or so. Then press the button back into the laptop to help push out the PC Card. Store the PC Card in a proper place, such as in your laptop bag or in a drawer or cubbyhole with the rest of your laptop gear. The idea here is to keep the PC Card from being stepped on or crushed by a 20-ounce ceramic coffee mug.